On November 14, 2017, Robert Mugabe, the long-time dictator of Zimbabwe, was forced to resign from office following a military coup initiated by Emmerson Mnangagwa, Mugabe’s former vice-president who assumed power after the coup. This coup put an end to almost 30 years of uninterrupted rule under Mugabe, and rekindled hope among many Zimbabweans that their lives would finally begin to improve after decades of economic stagnation and ultimate decline. However, one year later, Zimbabwe remains far from recovery; despite government attempts at reform, the local currency is plunging in value, corruption persists, and businesses are closing their doors. Should this continue, Zimbabwe could be on track to encounter a financial disaster of a similar scale to its 2008 fiasco. Under Robert Mugabe’s rule, the Zimbabwean economy was poorly managed. Between 2001 and 2009, Zimbabwe’s Gross Domestic Product (GDP) steadilydeclined, due in part to the country’s involvement in the 1998 Second Congo War, which costed the country hundreds of millions of dollars with no financial gains in return. In addition, Mugabe initiated a “Fast Track Land Reform” program in 1999, which allowed the government to strip white farmers of their land without valid reason nor compensation. The land would subsequently be given to black-Zimbabweans, most of whom did not have any experience in farming and were selected solely for their loyalty to Mugabe. Unsurprisingly, the redistributed land was mismanaged, causing once fertile farmlands to lay barren, as well as the unemployment of thousands of farmers to steadily increase. Zimbabwe, once known as the breadbasket of southern Africa, can now barely feed its own people. The aforementioned economic-risk factors led to massive hyperinflation and debt, as the government printed too much money to pay for the war, and the land reform project contributed to a decline in agricultural output, which coincided with decreases in industrial output as well as GDP per capita. By the end of 2008, inflation rates peaked at 79 billion percent per month and unemployment reached 94 percent. This resulted in absolute chaos, as salaries could not keep up with the inflation, making basic goods unaffordable and wiping out citizens’ savings. In 2009, inflation was so bad that the Zimbabwean dollar ceased to be printed and the U.S. dollar was adopted as the de facto currency. By the time Mugabe stepped down, Zimbabwe had just succeeded in paying off its debts to the International Monetary Fund that had been due 15 years prior, but the country still owes billions of dollars to the World Bank and the African Development Bank. During the Mugabe era, corruption also ran rampant. Police officers were poorly trained and earned low salaries, which eventually led to the widespread normalization of bribery and extortion; paying off police officers to avoid harassment, intimidation, or arbitrary arrest became commonplace at checkpoints all over the country. Furthermore, among government officials, graft and bribery were also common, with Transparency International stating that at least one billion dollars a year were lost due to corruption. Beyond its immediate consequences, the prevalence of corruption meant, and still means, that foreign companies and countries are less likely to invest in Zimbabwe, further hurting economic prospects for the struggling nation. Under Mnangagwa, Zimbabwe’s new president, some promising reform has been implemented. Some of the land confiscated during the “Fast Track Land Reform” has been returned, and partnerships are being built and strengthened between the government and farmers to increase agricultural output. As well, the new government has worked to cut the excess spending of the Mugabe government, such as that which was wasted on an overstaffed and overpaid civil service, lavish benefits for government members, and the privatization of hugely unprofitable, state-owned firms. The money saved from these cuts has since been redirected into sectors such as education and healthcare. Furthermore, new taxes, such as a 2% tax levied for money transfers, have been raised in an attempt to pay off the country’s mounting debt as well as allow the state to secure future loans. Most recently, oil companies have discovered oil and gas deposits in the north of the country and are currently in the process of determining if they are commercially profitable. If there is proof of potential, the profits from oil would be a massive and much needed boost for the cash-strapped government. Yet, in spite of these recent reforms, major issues still persist. Since 2015, when the Zimbabwean dollar was withdrawn due to its worthlessness after a decade of hyperinflation, Zimbabwe has lacked its own official currency. The government has tried to solve this issue by introducing a local bond that is pegged to the US dollar but even this new currency has failed to secure value. The government is over-printing money much like it did in the early 2000s, causing it to be traded on the black market for less than parity. Instead of being worth its official value of one dollar each, the bonds have been traded for as little as 5:1. As a result, businesses such as KFC have been forced to close their doors as the struggle to adapt to the new economic environment and surmount the extreme shortages of basic goods became too much for the business to handle. If left unchecked, the new bond currency is likely to also face hyperinflation, which would result in a repeat of Zimbabwe’s 2008 disaster. 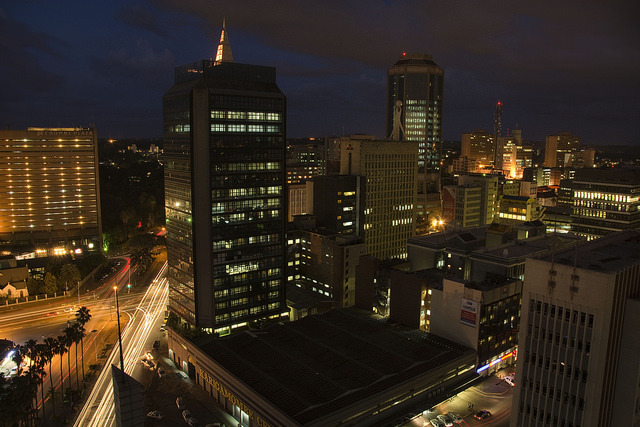 Zimbabwe has massive potential as an economic powerhouse: its geography allows for large scale agriculture, it is extremely rich in minerals such as gold, platinum and diamonds, and it has one of Africa’s highest literacy rates at over 90%. However, due to almost three decades of mismanagement, the economy is in a critical state. Despite efforts to implement economic reform, it is clear that the steps being taken by Mnangagwa’s new government are not enough; the government needs to appeal to the international community for aid and properly address the corruption that is rife within the country.